SellingRestaurants presents a fusion of Italian, Malaysian and American Food all at one location in this inventive restaurant. The owners came in and revamped the entire restaurant from scratch about 5 months ago redoing everything themselves. They have put alot of time and energy into this business and now need to sell it. It has a type one hood, at least 40 feet long, the biggest I have ever seen. They installed all new appliances, made portable steam tables with 6 individual units in each for use anywhere in the restaurant. 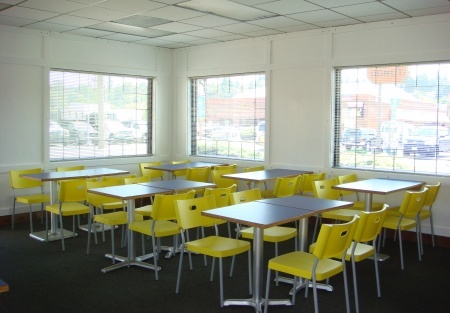 The tables and chairs are handcrafted, the kitchen is fully equipped and wide open for work in. The best part of the restaurant is the 10 car stack up drive thru. With our "To Go" society today, these types of loactions are far and few between. The seller is only asking for a fracttion of what they spent to get this restaurant open. It is on the main drag in Kent and the area is hopping. Call me and I will set you up for a tour.